Healthy Air Living is an initiative that provides education and opportunities to make personal or professional changes that will result in big improvements in our air quality. The goal is to encourage Valley residents, businesses and schools to make lasting changes in the way they live their lives, so that our air quality is positively affected. Learn About Our Schools Program! Healthy Air Living not only cleans up our Valley air, but it also gives us a better quality of life through better health! The same choices we make to reduce emissions also improve our individual health. For example, riding a bike prevents the emissions that driving your car would have put into the air, and it also gets your body moving, which is good for your personal fitness. Make a change, get involved, spread the word and live a Healthy Air Life! By making one simple change, you can help clean up our air. Healthy Air Living will give you the resources you need to incorporate clean-air strategies into your life and work environment, as well as connect you to other people who want to help the Valley breathe healthier air. Be a Healthy Air Hero! San Joaquin Valley children, their parents and teachers, are invited to request a copy of the new Healthy Air Heroes educational activity kit. The kit includes a pencil, crayons, stickers and a toy and features an activity book that is geared for kids in grades K-6. 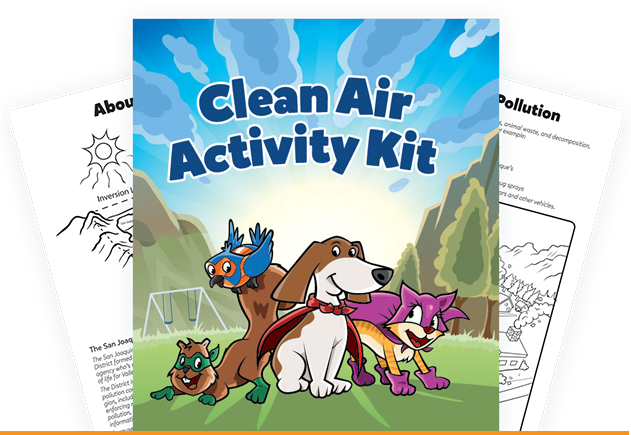 Designed to explain the struggles the Valley faces with air pollution, the activity book depicts four everyday common animals as Healthy Air Heroes that explain how Valley children can help make the air in our Valley cleaner and healthier. Receive real-time air-quality data directly from the nearest air monitor to help you evaluate air quality and determine the right time for outdoor activities. RAAN also provides Real-Time Outdoor Activity Risk (ROAR) guidelines based on five different air-quality levels. These highly successful programs are voluntary and reduce emissions, favorably impacting air quality in the Valley. 2017 - Valley Air District. All Rights Reserved.